If I were going to buy a brand new cruiser tomorrow, I would make it this Vulcan S. I think that is one of the highest recommendations I can make. It has a lot of features that make it very beginner friendly and at the same time it’s style is something that can’t be ignored.If you get a chance to test ride this bike you may not want anything else. Here is a motorcycle I have found to be widely misunderstood and certainly underestimated by those who haven’t swung a leg over it to lay some tracks down a sheet of asphalt. Only owners really seem to get it and I have started to see the light after talking to a few and witnessing this bike in action. At first glance it seems just another lightweight cruiser with some new age styling reflected in its sweeping frame angles and sloping headlight… nothing new to see here, move along. Then the “S” under the familiar Vulcan name on the side of the fuel tank comes into focus when you realize this bike features the same engine as the 650 Ninja with some tuning done in order to achieve more low end torque and linear type power while still retaining much of it’s sportbike brother’s racy attitude. Add to that Dunlop Sportmax tires and higher footpeg clearance than typical Vulcans or even other cruisers in its weight class and you slowly start to realize this thing is a SPORT cruiser. You can take deep leaning turns with the S without dragging pegs like you would on most other cruisers. There’s ample passing power even when in 6th gear on the highway out of the parallel twin engine, but you’ll enjoy its responsive and easy to find “oomph” at any rpm. Intrigued? I know I was right away and this sporty cruiser style had my memory wandering back to revisit the Kawasaki Meanstreak 1600 which went out of production in 2008. Certainly the Vulcan S doesn’t have the displacement or power numbers the 1600 mean streak did, but I think they are similar in that neither would be happy if described as just a cruiser being that both bikes have sporty intentions and ability when it comes to performance. Maybe we could label the Vulcan S the Not-Quite-So-Meanstreak or Meanstreak Jr? The Honda is a good one to compare to the Vulcan S because it has close to the same power level, seat height, and weight giving it similar handling characteristics. It’s not quite as nimble or sporty as the Vulcan S, but it’s definitely in the discussion in that regard. Purchase price new is very close to the same as well. The fuel economy available in the model with the Dual Clutch Transmission (Automatic transmission) is phenomenally good so it would have better range than the Vulcan. Sadly, DCT isn’t available on the bike for us here in Canada according to a dealership I visited in Calgary. It feels much lighter than it is and is comfortable to sit on and ride for extended periods. The clutch was very light, easy to pull in and overall it’s a very comfortable feeling bike to sit on and ride. 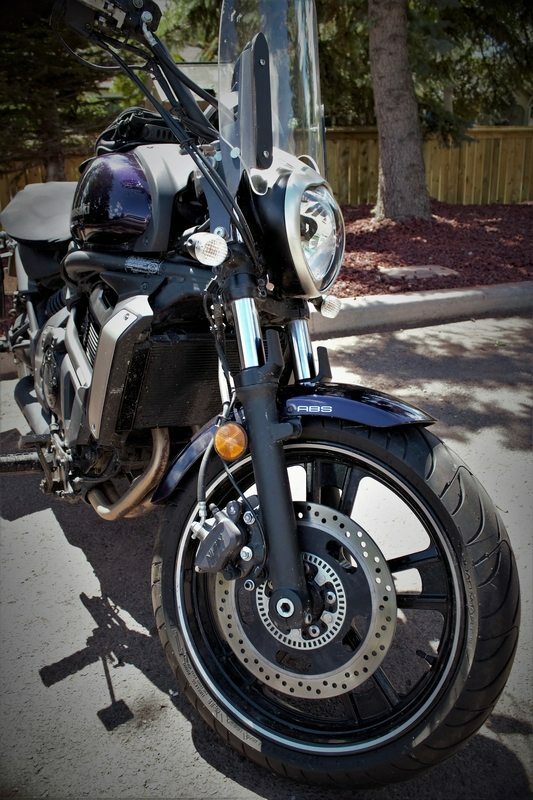 It’s more of a touring-centric bike than the Vulcan S as evidenced by factory equipped Metzeler long life tires along with the full upper fairing, optional hard saddlebags, an available taller windshield and slightly more ergonomic seat. On paper this sounds like a better bike than the Vulcan, but in person things jumped out at me that made me wonder. What I found lacking in the Honda was a shaft or belt drive which would be better for long touring rides when the rider doesn’t want to fuss with chain maintenance. There are what appear to be speaker-sized, mesh openings on either side of the fairing, but no radio is optional on the CTX and I am at a loss to explain the phony speaker openings on the bike. The instrument display is too small for my liking with only black on grey readouts and would be difficult to read in bright sunlight unless you have hawk like vision. This falls short when compared to the light blue backlit Vulcan display found at a nice height for the rider to glance at anytime. The Vulcan display also has more information available on it like fuel economy and gear position. 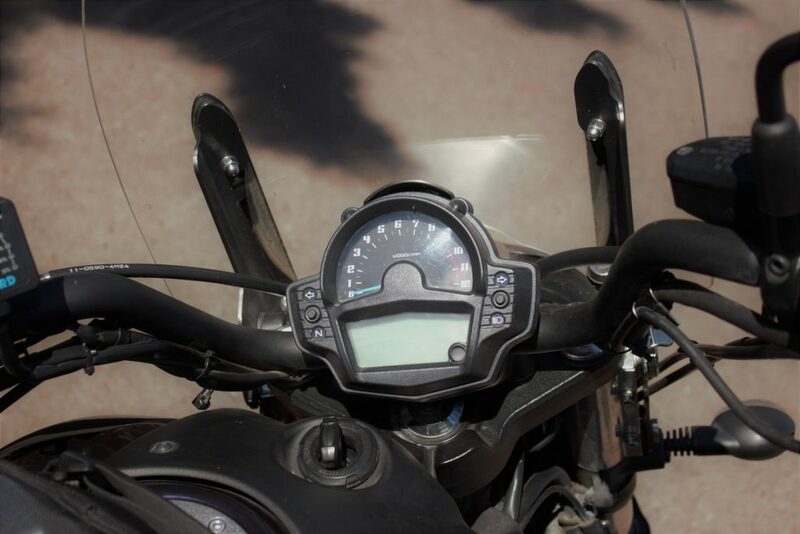 Taller riders may find their knees hitting on the upper sides of the fairing that hang out and there’s no adjustment available for foot pegs or anything to mount highway pegs on in the area. There is a strange storage compartment located in front of the rider in what should be the fuel tank, accessed by opening two separate covers. The pocket inside looks only large enough to store a sandwich in. I’m not sure what Honda had in mind to keep in there, but it’s unsafe to access while moving, lacks a locking mechanism, and is too small to really be of much use. Perhaps Honda designers often get a hankering for a BLT while out riding their CTX700s? Despite these questions I still feel the CTX would fit many new riders’ list of wants well, just not as much as the Vulcan should. Comparing a 900cc T100 engine to the Vulcan’s 650cc may seem off side, but the power numbers are very comparable as it turns out. It’s a parallel twin like the Kawasaki, just 250cc bigger and a SOHC design. This bike is very stable at any speed and just feels solid on the road. So much that it often tempted me to take both hands off the bars while riding along. This Triumph is the ying to the Vulcan’s yang when it comes to styling and so will appeal to riders that like the original Bonneville’s 1959 styling Triumph was known for mixed with new technology like fuel injection, ABS, traction control, Torque assist clutch and optional cruise control. The speedometer and tachometer each have small display windows in the lower portion that can cycle through several tripmeters, distance to empty fuel tank, instant fuel economy, clock, and gear position sensor. I quite liked that amount of information being so accessible, except that the numbers are a bit small to read on both speed and rpm. It may just be that I’m getting old though. The Vulcan display is easier to read comparatively. The seat height of 31 inches is 3 inches higher than the Vulcan but shouldn’t be a big factor for most anyone to deal with. 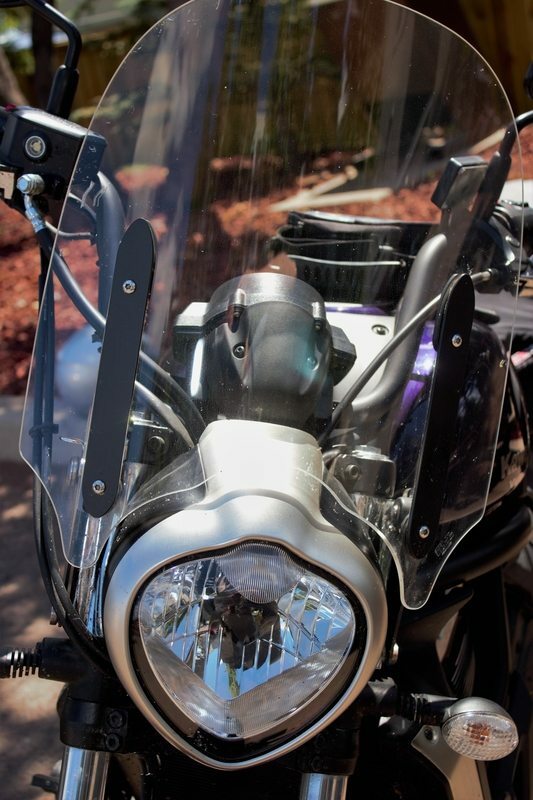 There are a few different factory options for different windshields and saddlebags available for the T100 just like the Vulcan, but passenger pegs are standard. I really like that old world styling/new world tech mix a lot. That retro look and Triumph brand heritage is really cool and stands out in a crowd. There’s very little plastic on the bike giving it a real sturdy and strong appearance. The T100 handles very well at any speed, and thanks to a 270 degree firing interval the engine is silky smooth and really nice to ride at any speed. The power is civilized but won’t leave you wanting, and handling very entertaining due to the low end grunt off the line and slightly more sporty riding position than the Vulcan. The only sticking points with it are the price and the gear shifter being mounted too low for my liking. It’s also only a 5 speed transmission compared to the Vulcan’s 6, but I didn’t find myself looking for another gear at highway speeds. Is it really worth $3,000 more to have cool looks and some added technology for pretty marginal power gains? If price wasn’t important to me then I would likely choose the Triumph over the Vulcan, but like the majority of people I haven’t won the lottery yet and dollars matter. Who Should Buy the Vulcan S? The Vulcan holds its own against the competition very well but there is one feature that truly setting it apart from them: The Ergo Fit option. People who are unusually short, petite and those who are unusually tall or large at the other end of the spectrum. The Ergo Fit system uses different handlebars, seats and a three position footpeg mounting system to allow riders 5’6” and under to use the reduced reach setting, Riders 5’6’ up to 6’1” to use the mid reach setting and those 6’1” and up the extended reach setting. This is setup at no extra charge by the dealership when the bike is purchased new, but the different bars and seats can be purchased anytime if the bike is sold to a different sized owner later. I couldn’t find any other examples of bikes which could be fitted to owners so well in the same price range as the Vulcan S.
When you really want to know about a bike, salespeople are a good source for specs and stats, and a blogger like me can tell you what it’s like during a short test ride, but only an owner can give you the straight goods in my opinion. 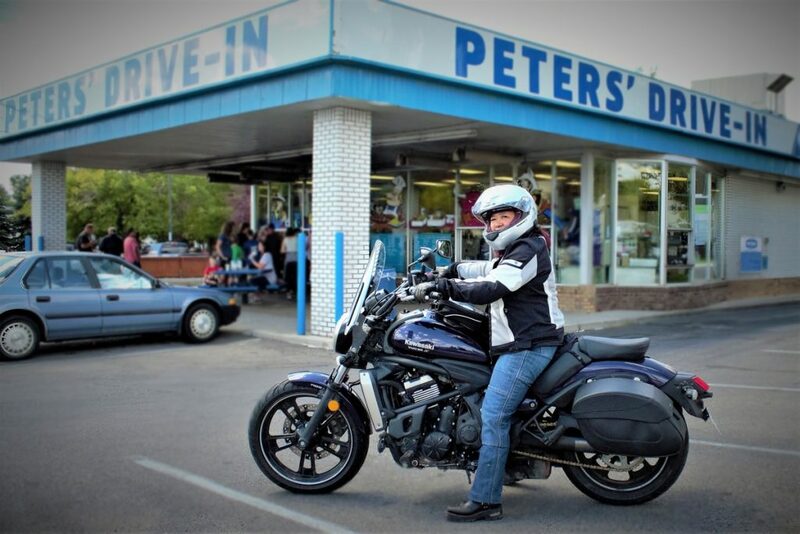 I was fortunate to interview a couple of owners about their bikes, the first one being Tina from Calgary, Alberta about her 2015 Vulcan S.
Tina is all of 5 feet tall and easily described as petite by anyone’s standards. She’s as tough a biker as I’ve ever come across though and handles her bike well. She got her motorcycle license 2.5 years ago after finishing her rider training course and started out on a Yamaha V Star 250. After only 2 months of putting on the miles she inquired with the dealership about its first service only to find out the cost was 20% of the price she had paid for the bike! That didn’t sit well with her, and since she was finding the 250 shy on power anyway, a change of ride was in order. The Vulcan S was her easy pick after a test drive and learning about Ergo Fit given that at her size options are few in number when it comes to fitting a bike. She considered the Harley Davidson Sportster 883 as well, but wisely decided against it because Harley replacement parts are expensive and beginners often drop their bikes during the early years of riding. 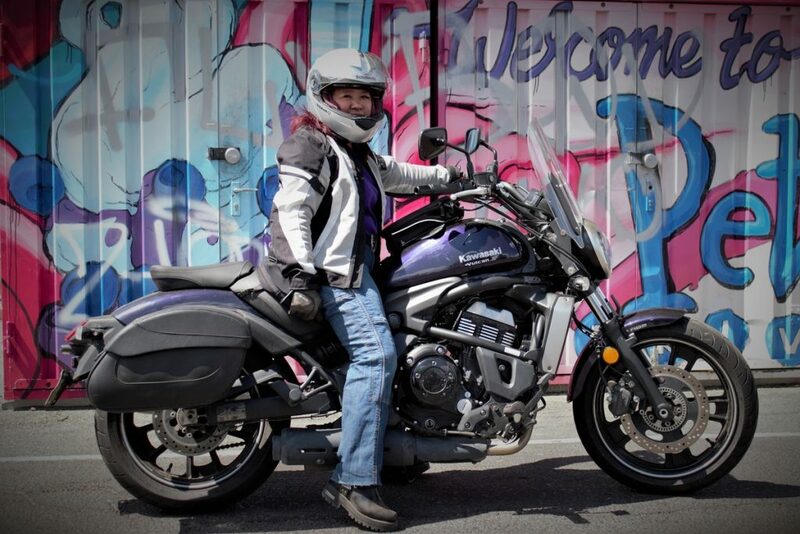 Tina was keen to take long rides so she opted for a crampbuster throttle assist to help avoid hand fatigue, an AirHawk seat, a tank bag, heated grips and a few Kawasaki factory options like a windshield, leather saddlebags and the passenger footpegs. The Vulcan fits her perfectly, handles in a way that makes her feel confident and she says the power is just right. She has all she needs in the city, on the highway and then some. She is active with a few touring groups like Women in the Wind despite the fact some people have opined the Vulcan S isn’t big enough or powerful enough for touring. 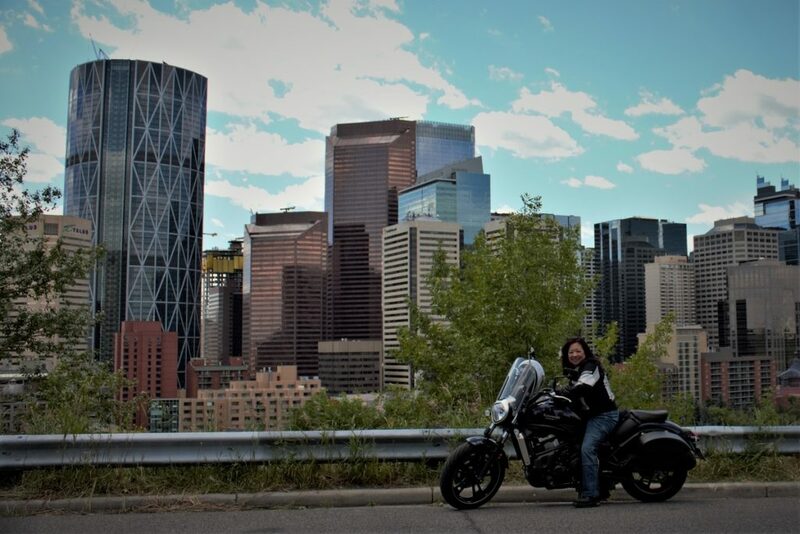 Proving them all wrong, last year Tina rode her bike from Calgary up to Alaska and back through British Columbia about 7600 kms round trip. The Vulcan took it all in stride according to Tina. It must have since over the last two seasons she has racked up 33000 kms on her Vulcan. 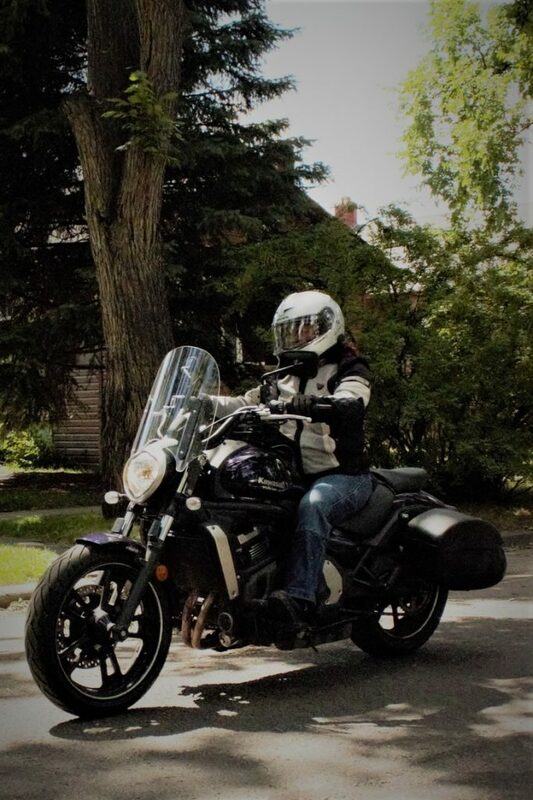 Next week she is riding down to Denver, Colorado and then making her way over to South Dakota to experience Sturgis for the first time on board the Vulcan. While talking to her about the bike she mentioned if she had it to do over again she wouldn’t have bothered installing the passenger pegs in lieu of a single seat and luggage rack combo which she would have used on her touring rides. I decided to volunteer to be her first passenger on the Vulcan just so she could have that experience and not feel like she wasted her money putting on the rear pegs. The bike carried us both just fine and Tina got to experience the effect a second “meat bag” on a bike has when it comes to acceleration, braking and low speed maneuvers. I asked her if she had any other complaints about the bike. From a mechanical perspective it has been flawless since new other than the rear turn signals which kept loosening up and nearly falling off over time. She solved that problem by having her mechanic bolt them to the fender assembly. Her biggest complaint was that there aren’t any hard shelled, lockable saddlebags with a decent capacity available for the bike from Kawasaki or anyone else she had found. This is a must have for a touring bike and I couldn’t find any after a quick search either. Kawasaki may have missed an opportunity on this one although I’m not sure they figured anyone would be touring with it quite the way Tina does. The factory ones she put on are barely big enough to hold basic necessities like rain gear, emergency supplies and all important snacks for the road. I asked her if any of these grievances would be enough to give her buyer’s remorse about the Vulcan S, but no she would do it all over again and recommend the bike to anyone all the same. Having said that, Tina is already looking at her other limited options since she plans to tour even more extensively going forward. She’s considering the Indian Dark Horse Chieftain and the Yamaha V Star 1300, but isn’t sure whether either will be a good fit or not. Really if she could simply find some higher capacity, locking, hard bags for the Vulcan S she would probably just stick with it. It’s that good. 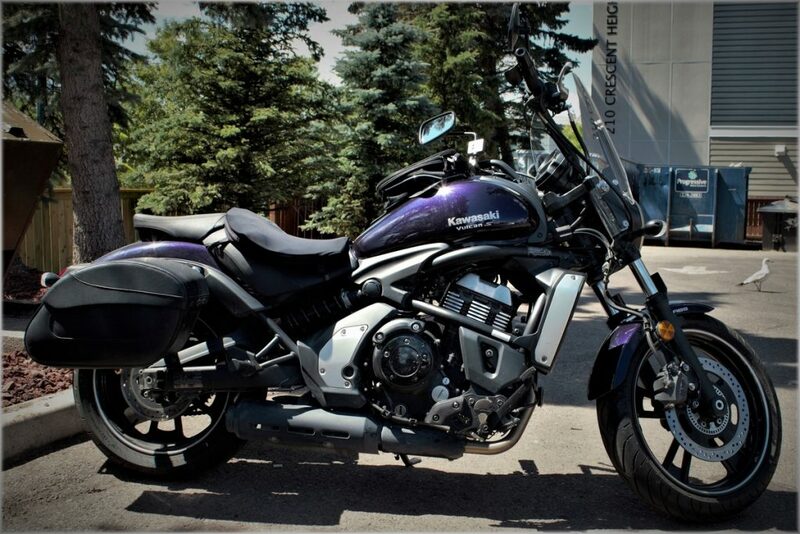 The Kawasaki Vulcan is a Beginner Motorcycle Staple… or IS it? Another owner I spoke to named Logan Wight actually works at Pro-Am Motorsports http://pro-am.ca/ in Calgary as a salesperson. They sell Honda, Yamaha and Kawasaki bikes there and Logan more often than not recommends the Vulcan S to prospective buyers. Why wouldn’t he since he sold one to himself? He had all the same praises to sing about the Vulcan Tina did, and would definitely recommend the windshield and other accessories but feels the Vulcan S shouldn’t necessarily be labelled just a beginner motorcycle because of the power it has. He feels it’s more of an intermediate bike overall, but is also totally appropriate for a newbie rider. 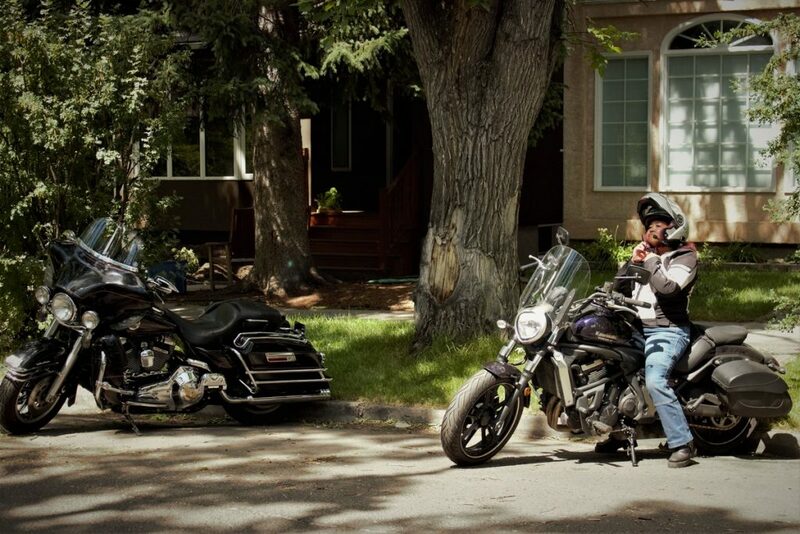 Logan and I both feel you could stay with the Vulcan a long time, especially if you are primarily a city rider. Make no mistake about this bike, it has some get up and go. I was test riding a Kawasaki Z900 recently with another rider aboard a Vulcan S when I was taken aback by the Vulcan’s power. The rider on the S decided to show me what the “little bike” had to offer compared to the 126 hp Z900 I was on by dropping a gear and hauling on the throttle while cruising along at 110 kph. Let me tell you that bike pulled away like I was standing still and I had to actually drop a gear myself to catch up. I was very, very impressed with what a good rider could do on that Vulcan. Add to this there are owners disconnecting the throttle limiter/governor in order to gain more speed and power. I can’t recommend doing this for safety and warranty reasons, but again it’s clear many owners are going for it. Logan also pointed out how nice having a gear position indicator on the easy to read display is and that even without having a windshield the sloping headlight is surprisingly effective at deflecting some wind up over the rider. I could tell he is a passionate owner of the Vulcan S who has spent a lot of time listing the pros and cons of it while comparing it to the competition. When the Vulcan S first appeared in 2015 there were some issues with downshifting from third to first gear for certain owners. Kawasaki issued a recall on the bike in order to rectify the problem with a different return spring on the shifter arm. Neither Vulcan S owners I spoke to have experienced this issue, so I think it’s safe to say it’s been sorted out by Kawasaki on the bikes now. If you happen to have this happen with yours you can go to the dealership to have it repaired at no cost. 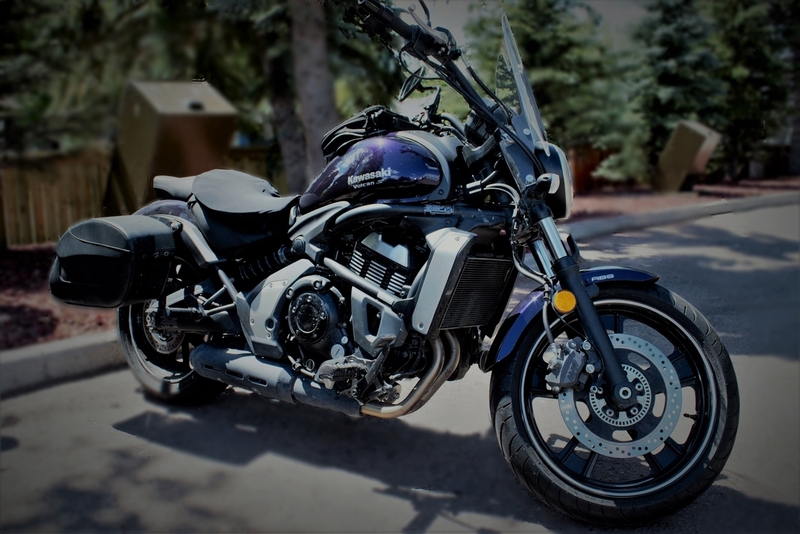 Summary: The Kawasaki Vulcan S – Yay, or Nay? Ok I admit it, I’m a little biased on this one because I’m a big fan of Kawasaki bikes in general, especially all things related to the Ninja sportbikes. My first on road bike was a 1985 Kawasaki GPZ 305 which was a parallel twin, air cooled sportbike. 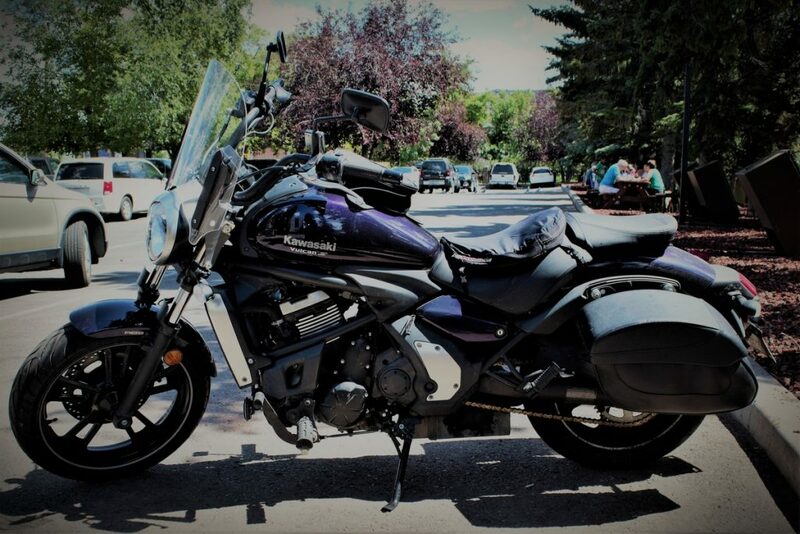 That fond connection for the Kawasaki parallel twin engines really made me take a shine to the Vulcan S even before I started learning about it in depth for this review. It has all the markings of a fun and good all around bike even though it’s only been in production since 2015. My experience is that Kawasaki specializes in building bikes that are fast and fun for owners so to me it’s a total slam dunk on owning one. They have always had the fastest or biggest engine production sport bikes and seemingly just can’t accept any of their machines to be found wanting in good, usable power at a reasonable price point. The Vulcan S is no exception. If you’re someone who wants performance and comfort this bike a really good fit for you.